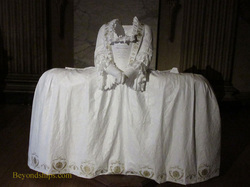 Queen Anne endured 17 pregnancies. However, none of her children survived her. As a result, when she died in 1714, Parliament had to find a new monarch. George Ludwig, Elector of Hanover, spoke little English, had never been to England and had only a remote connection to the throne of Great Britain. However, he was a Protestant and he not going to compete with Parliament for power. George I was not impressed with any of the British palaces. He would have liked to have had something that rivaled Louis XIV's Palace of Versailles. However, he sensed that his hold on the throne was somewhat tenuous and spending a vast fortune on a new palace would not please his new subjects. Therefore, he contented himself with improving Hampton Court and Kensington Palace. For Kensington Palace, he employed the artist William Kent to create a series of state rooms. Walking into these rooms, it is immediately apparent that the occupants were much grander than their Stuart predecessors. The decoration is much more elaborate and ostentatious. George had a very bad relationship with his son, a characteristic that would plague all of the Hanoverian kings. Indeed, at one point, George I banished the Prince of Wales from court and refused to allow him to see his own children. Nonetheless, George II continued the work of enhancing Kensington. Under George II, Kensington became the center of court life. Queen Caroline patronized artists and writers and the court at Kensington was considered quite brilliant during her lifetime. While George had numerous mistresses, he was devastated by Caroline's death in 1737 and the vibrant court became a memory. His grandson, who came to the throne as George III, preferred Kew Palace and as a result Kensington ceased to be a center of court life. The King's Staircase, painted by William Kent, is perhaps the most famous room at Kensington. Above: The rooms dedicated to the early Georgians are more opulent than those of the late Stuart monarchs. Below: Re-enactors portray Queen Caroline and one of her ladies. The last personality reflected in the public rooms of Kensington Palace is that of Queen Victoria. Kensington Palace was where Victoria was born, where she grew up and where she became queen. From a very early age, every one knew that Victoria would some day become queen. She was the daughter of Edward, Duke of Kent, who was a son of George III. The Duke of Kent's elder brother had followed their father to the throne as George IV but his only legitimate child, Princess Charlotte, predeceased him. Therefore, another brother, William IV, succeeded George IV as king. For most of his life, William had lived contentedly with his mistress and numerous illegitimate children. However, since he had no legitimate children when he became king, the daughter of his late brother the Duke of Kent became the heir apparent. The Duchess of Kent kept her daughter on a very short leash. Under the oppressive “Kensington System,” Victoria was raised at Kensington Palace in isolation from her contemporaries and away from her uncle's court. Indeed, Victoria had to sleep in her mother's room even as a teenager. To make matters worse for the young Victoria, the Duchess was under the sway of her secretary Sir John Conroy. Power hungry, Conroy came up with a scheme in which Victoria would appoint the Duchess and him regents even if King William died after Victoria reached the age of majority. But Victoria did not like Conroy and refused to consent to this scheme despite various attempts at emotional duress. One night in June 1837, Victoria was awoken and told that a the Archbishop of Canterbury and the Lord Chamberlain wished to see her. When they addressed the 18 year old girl as “Your Majesty,” she knew that William had died and that she was now queen. Shortly thereafter, Victoria held her first meeting of the Privy Council at Kensington. Victoria was a dedicated diarist and several of the officials that attended also wrote down their recollections of that moment. Excerpts from these writings have been placed around the rooms at Kensington where Victoria received the news that she was queen and held her first meeting with her ministers. They breathe life into the rooms. Above: The Red Salon where Queen Victoria held her first meeting with the Privy Council after becoming Queen. The Queen did not remain at her girlhood home. Instead, she soon moved to Buckingham Palace where she had her own rooms. As an unmarried woman, Victoria was expected to live with her mother and so her mother was also given rooms at the new residence albeit far away from Victoria. The hated Conroy was banished from the Queen's household. After Victoria departed, Kensington Palace was allowed to deteriorate. However, later in her reign Victoria recalled her childhood home and ordered that the palace be restored and the State Apartments opened to the public. 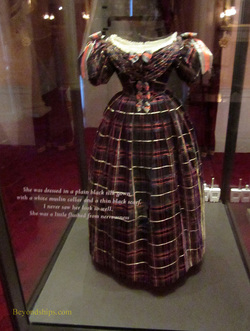 In addition to the Red Salon where Victoria held her first Privy Council meeting and the room believed to be where Victoria was born, on view at Kensington are several other rooms with exhibits about Victoria's life. These include clothing, toys and other artifacts as well as photographs and works of art.